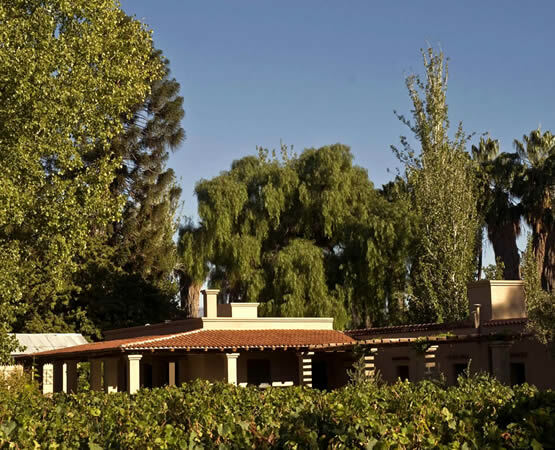 The Malbec vineyards, the one-hundred-year-old olive grove, the park and the setting of the snow-capped Andes create a quiet and private atmosphere that fills the soul with joy. The Inn is an historic construction that dates back to the 19th century. It was carefully re-built to preserve the quality of the material and the original atmosphere. Ever since its creation, the house used by the people in charge of the Don Ángel Cavagnaro`s farm. The main house – one of the most traditional in the area – is located next to the Inn. Its high English style ceilings are central to the setting and so is the enormous terebinth tree. 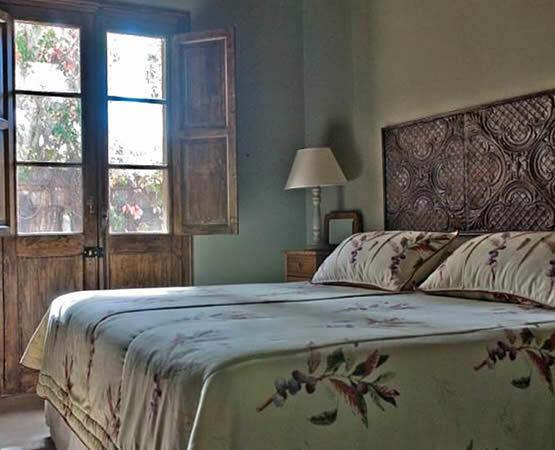 The design of the inn preserves and combines the features of a typical country house in Mendoza – including a large, spacious gallery – with the safety and comfort of a modern hotel. The three bedrooms with private bathrooms invite one to rest and relax, away from the hustle and bustle of the city, with the birds singing in the background. In the gallery, you can have a glass of wine and a selection of cheeses at sunset while admiring the vineyards, the olive trees and beyond that the snow-capped Andes. The pool of the inn is another ideal spot to relax. 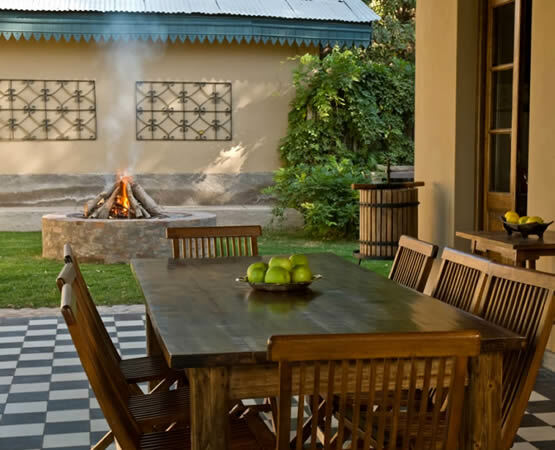 Located among the vines of Malbec, this spot is well worth an evening drink and snack to take in the peace of the surrounding grounds. 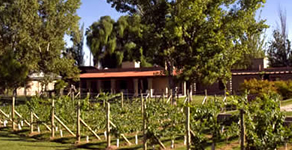 The Inn is situated in the middle of a small farm in the heart of Coquimbito, Maipú, along the Wine and Olive Route and 16km from the city center of Mendoza. 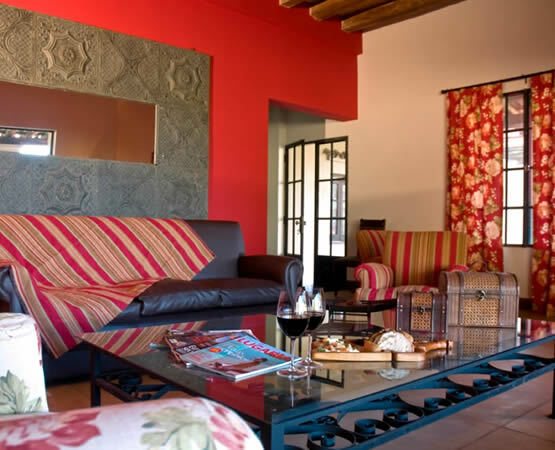 The shared areas of Verde Oliva are warm and enjoyable allowing one to spend causal, quality time in the inn. At the heart of the house you can find a large living room that would be the ideal complement for a special afternoon devoted to exploring the inn’s library, which is fully equipped with books on wine and oil production in Mendoza, geography and history of the region, tourism and many more titles by local authors. • Welcoming glass of wine. • Park, pool and shared areas. • Harvesting of olives and Malbec grapes. • Lunch or dinner upon advanced request. • Olive oil therapy massages upon advanced request. • Wine and olive oil tasting, organized by specialists upon advanced request. • Assistance and advice on specially programmed activities (Wine Tours, Wineries, Oil Factories, cycling tours along wine and olive routes in Maipú, horse-back riding, adventure sports, tours to the mountain, etc.). The three bedrooms with private bathrooms invite one to rest and relax, away from the hustle and bustle of the city, with the birds singing in the background. The Inn has three 24 square meter bedrooms, each one with its own private bathroom and equippd with cool and warm air conditioning and king size sommier beds, whose mattresses are 1,8 x 2 meters and 30 cm thick. In one of the bedrooms there are 2 Twin size sommier beds, whose mattresses are 0,90 x 2 meters and 30 cm thick. The vineyards and the olive production of this property are used to make Malbec wine and olive oil. They are also the main natural ingredient used in the exclusive cosmetic products of VERDE OLIVA and UVA ROJA. Our visitors are welcome to try and enjoy the relaxing olive therapy massages in the privacy of their rooms as well as outdoors where they can appreciate nature during warm days. Assistance and advice on wine tours. Nearby Wineries: Bodega La Rural and its ancient Wine Museum, Bodega Peñaflor, Bodega Cavas del Conde, Bodega Viña El Cerno, Bodega Tempus Alba, Olivícola Laur, etc. 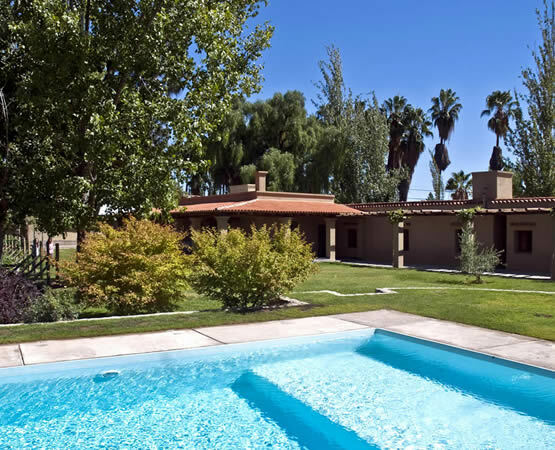 Verde Oliva Inn is situated in the middle of a small farm in the heart of Coquimbito, Maipú, along the Wine and Olive Route and 16km from the city center of Mendoza. Our Inn is just a few meters from the emblematic square Plazoleta Rutini, which marks the intersection of Montecaseros and Urquiza streets. It takes 15 minutes to get from the inn to the city centre of Mendoza. Despite its proximity to the city, Coquimbito preserves its rural atmosphere, which has characterized the district for decades. You can see both cars and bicycles going along its amazing streets full of poplar and eastern cottonwood trees. This place’s true identity is given by the many vineyards and olive plantations, adobe houses, old grocery stores where nobody is in a rush and last but not least a very attractive combination of one-hundred-year-old wineries and brand-new enterprises.